Pendant diameter: 30mm Weight:15g (0.46 oz) Chain length: 23.6"
Usage: When you receive this necklace set, apply a few drops of your favorite essential oil to one of the refill pads, then put the pad into the locket and close the locket. Well, you can wear it now. Our aromotherapy diffuser necklace chain is 23.6" long. So just adjust the length you prefer, longer or shorter. There are two patterns for the locket, two styles of experience.10 different colors pads for your choice and they are washable. Reusable and washable pads. Rinse with ordinary detergent and dry naturally. 1. Use a piece of delicate cotton cloth to keep the necklace bright. 2. If there is dirt on the surface, you can use warm water and take meticulous cleaning cloth dampened a mild detergent to wipe gently. 3. Avoid collisions,crush and scratch. Want to make it as a gift? Good idea! It is realy a nice , practical and thoughtful gift set.You can choose this necklace set for yourself, alternate use or share it with your best friend or family. Wearing this essential oil diffuser necklace will respect your elegant temperament and bring you good mood. Fragrance around you all day long. It is perfect for every occasion, traveling, birthday, Mother's Day, Valentine's Day, Christmas, etc. HIGH-QUALITY MATERIAL-316L high quality stainless steel, solid and smooth, anti-corrosion, easy to clean. The 23.6" necklace chain can be adjustable as per your perference. 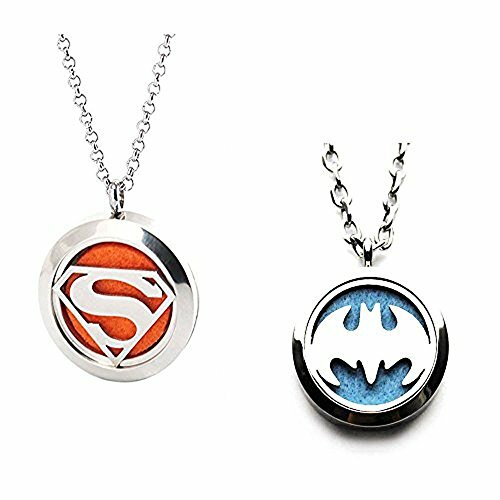 SAVE YOUR MONEY-Two styles pendant locket, alternate use. 10 different color refill pads. THE DIAMETER OF THE FELT PAD IS 25MM, please make sure you choose the correct one when you need replacement pads.